The juiciest and tender chicken I have ever eaten! Preheat oven to 180°C and place wire rack on lowest level. Rub Chicken from inside and out with olive oil, herbs, salt and pepper. 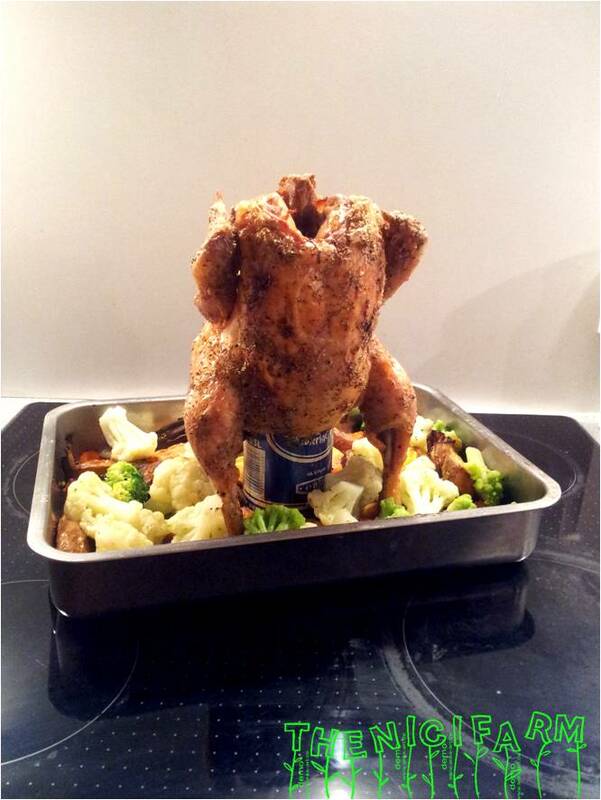 Pour out ¼ of the beer from the beer can (by drinking it ;-)) and put the garlic cloves and herbs inside. On a deep baking pan arrange veggies and mix with olive oil, herbs, pepper and salt. In the middle place the can and sit the can on top with the opening facing down. Bake for 1 hour. No watering needed. In the end take the chicken off the can and pour a bit of the liquid from the can on the veggies. YUMMIE!!! « How do you like my new self-made coat?